The U.S. state of Oregon has the death penalty on the books, but hasn’t employed it on a non-consenting prisoner since August 20, 1962. The late Oregon political lion Mark Hatfield, who was governor at the time, permitted the execution to go ahead despite misgivings about capital punishment. It was the only time he would ever be called upon to shoulder that burden: Oregon repealed its capital statutes in 1964 during the nationwide death penalty drawdown; Hatfield had moved on to the U.S. Senate by the time voters reinstated capital punishment in 1978. In an interview almost 40 years after the fact, Hatfield said that being party to McGahuey’s death still troubled him. As Governor of Oregon, how did you resolve your legal charge versus your moral feelings about the death penalty? Having been governor when we had an execution, I can tell you it still haunts me. However, when you swear to uphold the constitution of the State of Oregon you swear to uphold all of the laws — not just the laws you agree with. I felt there were too many examples in our history when people tortured the law or played around with it. So if you were governor today, would you have commuted that death sentence? Oregon currently retains the death penalty but has had a moratorium on executions enforced by its governors since 2011. Its only “modern” (post-1976) executions were in 1996 and 1997, and both were inflicted on men who voluntarily abandoned their own appeals to speed their path to the executioner. * Technically, McGahuey was executed for the murder of the child, 22-month old Rodney Holt: he’d slain the mother, 32-year-old Loris Mae Holt, in a fit of passion, but he followed up by bludgeoning the tot with premeditation out of (as he said) concern for the boy’s upbringing now that he’d been orphaned. —Robert E. Folkes, convicted of murder, gas chamber, Oregon. Folkes, age twenty-three, was convicted of slashing a woman’s throat on a Southern Pacific train while working as a cook. 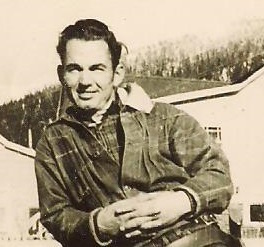 The Associated Press described him as “the first condemned man to see the chamber,” as Folkes was the first prisoner to ever walk into the Oregon gas chamber without a blindfold on. On August 30, 1878, Sevier (aka Severe, Savier) Lewis was hanged in Empire City, Oregon — today known as Coos Bay — for the murder of his much younger half-brother, Zachariah T. “Zack” Lewis on May 22, 1876. The brothers were two of Hiram Hamilton Lewis’s nine children. Hiram was 74 years old at the time of Zack’s murder, and ambitious in spite of his age: he was running for state legislature. Sevier, who was in his early fifties, was married and had seven children. Zack was twenty-five, single and still living at home. It was said he’d taken an interest in Sevier’s sixteen-year-old daughter Sylvia. Her father warned him to stay away, but Zack wouldn’t listen and kept coming around pestering his niece with unwanted advances. Finally Sevier had had enough. Sylvia confided to her young uncle that she’d been raped by her father, and become pregnant. Zack went to Sevier and told him to stop the molestation immediately or he would tell the entire family what he had done. He helped Sylvia move in with her grandparents to protect her, and told Sevier that if he touched her again, he would kill him. Sevier touched her again. 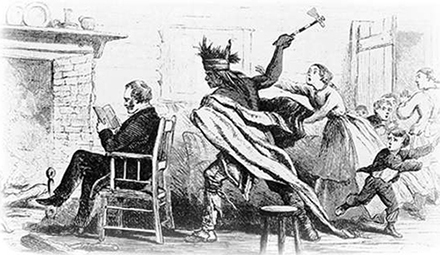 These starkly contrasting purported motives may assign which characters, in the ensuing violent tableau, don the white hats and which the black. But either way, one late spring day, Sevier loaded his gun and went to his father’s home where he found little brother working in the fields. Sevier shot him dead, and then took flight. In December 1877, a full year and a half after the shock murder and probably about the time Sevier was getting comfortable with having gotten away with it, a Coos County man chanced to recognize the fugitive in a hotel bar in Seattle and had him arrested. Sevier’s own father and Sevier’s own son both testified against him at the subsequent trial, traveling 200 miles to to so. His defense attorney didn’t try to pretend he was innocent and only pleaded for a recommendation of mercy. He was convicted of his brother’s murder in June 1878 and sentenced to be hanged by the neck until dead. The judge also ordered him to cough up $830.10 in court costs, including $21 worth of beer he’d been prescribed during his incarceration. It was a clean hanging. His neck snapped and Sevier Lewis died within minutes. What happened to Hiram Lewis’s political aspirations? Well, given the scandal, it’s no surprise that he lost the election. 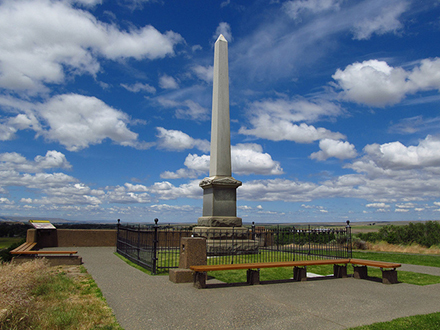 He moved to Lane County after Zack’s murder and died in 1879, supposedly of a broken heart. What can history tell us about which brother to believe? Was Sevier really trying to protect his daughter, or did Zack pay the ultimate price for his attempt to rescue Sylvia from her predatory father? Andie E. Jensen, author of Hangman’s Call: The Executions and Lynchings of Coos County, Oregon 1854-1925, studied the available records and notes that Sevier’s youngest child Lucy’s year of birth is unknown — the dates range from 1875 to 1877 — while all his other children had their exact date and place of birth recorded. He speculates that Lucy, said to be the daughter of Sevier and his wife Elizabeth, was in fact Sylvia’s child. This date in 1899 was the one appointed for the Roseburg, Ore. hanging of a miner named J.M. Olberman for murdering his partner-in-prospecting. 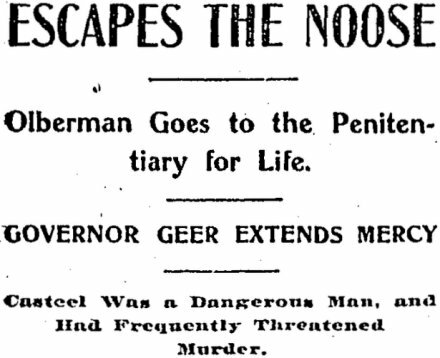 But as described in this April 28, 1899 story from the Portland Oregonian (transcribed in its entirety), a governor willing to “take a larger and less restricted view” of a case than the courts would do spared Olberman on the eve of his hanging. To my mind, these facts, which are well established, make a wide distinction between Olberman’s crime and that which is committed by a highwayman, who deliberately murders for gain, or the brute who takes human life purely for revenge, and there should be a distinction between the degrees of punishment following their commission. Courts are sometimes prohibited from going outside the forms of law and the record, although convinced, perhaps, that the equities of the case would warrant a different finding. It is to correct such conditions that the right to take a larger and less restricted view of the circumstances surrounding a case is given to the executive. It is great power to place in the hands of one man, and should be used very sparingly and rarely. I have an abundance of testimony from Myrtle Creek and Portland, where he lived for four years, that Olberman is a man of steady habits, and of a peacable disposition, and has never associated with the criminal class. The commutation of his sentence was asked by most of the people in the vicinity where the murder was committed, and the same request was made by letter to me by both the daughters of the murdered man, one of his sons-in-law, and three of the trial jurors. Olberman committed a great crime, but the provocation surrounding him makes him less guilty, in my judgment, than the other man who deliberately murders for either gain or revenge; and his crime being less his punishment should be less. I do not think I have erred in saving this man’s life, but if I have it has been on the side of mercy, and to do so is sometimes a positive virtue. Among those who signed petitions and sent personal letters to the governor in Olberman’s behalf were Governor Bradley, of Kentucky; a member of congress from Kentucky; United States Senator Joseph Simon, H.M. Martin, William Flocks and George McDougall, three of the trial jurors, and Mrs. May Stewart and Mrs. June Reynolds, daughters of the murdered man. Minutes after midnight on this date in 1909, an Oregon plasterer named C.Y. 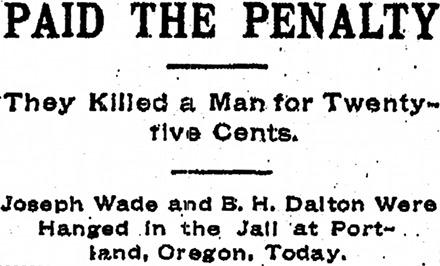 Timmons was hanged at the state prison in Salem, Oregon for the murder of Estella, his wife of two years. Timmons quickly regained his ability to speak and told authorities Estella had cut his throat while he was sleeping. He grabbed the razor from her hand, slit her throat in self-defense, and then finished her off with an ax. Then he lay down and waited until dawn before he went and asked for help. The truth came out, however, and at his trial in mid-January 1909, C.Y. admitted that he’d gone round the bend with jealousy over his younger wife’s* affair with one Robert Hornbuckle. C.Y. and Estella had been quarreling for a long time about her relationship with Hornbuckle. Only the day before the murder, the couple had met with an attorney to procure a divorce — a drastic measure in that day and age. During the meeting, Estella told the lawyer that her husband had a violent temper, especially when he had been drinking, and that he had threatened her life on numerous occasions. C.Y. apparently believed his victim’s alleged infidelity would outrage the jury into acquitting him. Not so; they deliberated a whopping 35 minutes before finding him guilty. C.Y. broke down in tears when the verdict was read. And, for what it’s worth, all evidence indicates that Estella’s “affair” with Hornbuckle existed only in her husband’s imagination. [A]t 12:31 p.m., the trap was sprung and Timmons dropped six feet, one inch. The force of the drop caused the neck wound to open and for some time the hanging figure breathed through the gaping wound beneath the rope, and the body was drenched with blood. The attending physicians differed on whether Timmons’ neck was broken in the fall, but later examination proved that the vertebrae had been dislocated. This complication, breathing through the open wound, prevented pronouncement of death until 12:54 p.m., and the body was allowed to hang another seven minutes to ensure he was dead. The murderer was buried separately from his victim, at the Lee Mission Cemetery in an unmarked grave. * Her age was given in different accounts as either 19 or 21; C.Y. Was 37. Another pathetic detail to her tragic life: Estella was an orphan, raised in an orphanage after her parents both died of tuberculosis. On this day in 1889, 60-year-old John F. Gilman was hanged in Oregon for the murders of William and Elizabeth Eationhover (Eatenhoover, Etenhover). Elizabeth and her husband Christopher were German immigrants. They arrived with their five-year-old son William in Coquille, Oregon in July 1888 and signed a five-year lease on farmland belonging to Gilman and his wife. The Eationhovers built a small house forty yards from John Gilman’s house. They hadn’t lived there long before they began having disputes with Gilman about just what they could do on his land. Gilman wanted them to move and offered to cancel the lease, but the Eationhovers refused to budge. Less than a year had passed before Gilman had decided the only way out of the situation was to cancel his tenants’ lease … on life. He tried subtlety first, poisoning their food. That didn’t work and he was forced to use a more direct form of homicide. On Saturday, July 12, 1889, Christopher was returning home after working all week at another, distant farm. When he reached the river, he noticed Gilman on the other side and asked him to row over and give him a ride. Gilman obliged and Christopher continued his journey home — but when he reached the corral, Gilman came up behind him and hit him in the head with one of his boat’s oars. He then pulled out a knife and stabbed him multiple times. Gilman had made a miscalculation, though — one that saved Christopher Eationhover’s life. He’d been carrying two knives in his pocket, and one had a broken blade. He’d mistakenly pulled out the broken one, and it could not inflict fatal wounds. As the two men struggled, ElizabethGilman’s wife came out of the house to break up the fight. Christopher then took the opportunity to get away. He staggered down to the river, rowed the boat across and went to get help. By the time he returned with a posse, however, his wife and child had disappeared. The kitchen table was set for breakfast, and little William’s plate still had food on it, long since grown cold. When the authorities arrived at the Gilman house, they found John Gilman in bed asleep. He hadn’t even bothered to change his bloodstained clothes. Arrested, he insisted he had no idea where the Eationhovers were or what had happened to them. He suggested that perhaps they’d followed after Christopher and got lost. A search party found them the next afternoon, poorly concealed in a shallow grave. Nearby was another, empty grave, presumably for Christopher. The two had died horrible deaths. Elizabeth had been beaten on the arms, hips and face, and had a bad cut on the back of her head, but the actual cause of death was strangulation. Medical evidence indicated she’d remained alive for a time after the beating. Five-year-old William had tried to run away, but his killer was too fast for him. He’d been strangled with a rope and his neck was broken. Gilman would later confess to the crimes. He said he had beaten Elizabeth and then ran off, leaving her semi-conscious and helpless, to kill the child. He then returned to finish off Elizabeth. He claimed he’d strangled the victims (actually hanging William from a tree) because he didn’t want to leave blood evidence in the house. While clearing out his conscience in this rummage sale (which sorely tempted lynch law), Gilman also confessed to another murder, that of George Morras in 1888. He later recanted his statements, but law enforcement believed he had in fact committed the crime. John Gilman was indicted for two counts of murder. His wife, Fidelia, was charged as an accessory, but later acquitted. John’s insanity defense failed, and there was no appeal or executive clemency. One final tragic detail in this very tragic story: on October 21, 1892, nearly three years after the hanging of the man who killed his family, Christopher Eationhover hanged himself.